Well, it's that time of the year again! Where has this year gone? As per usual, I will be having my 'birthday bash' special offering - July 1-9 buy two items and get free shipping. I will be posting photos of the tea towels I have available - pretty much anything I've posted in the last six months on my blog. 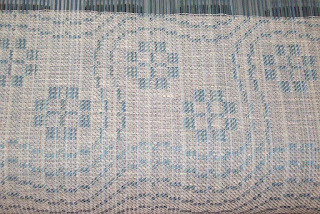 Which I realize isn't much but then, I haven't been weaving much, either. They are made from 2/16 cotton warp and a singles 20 linen weft. The design is Young Lover's Knot woven in twill blocks. I think there are six left. Have to check for sure. Or contact me to see if I have something in a colour you'd like. There are also lots of painted warp scarves, too many to try to post because each one is individual. The colours change along the length of each scarf, sometimes dramatically, sometimes subtlety. Towels range in price from $24 to $36. Prices will be going up this fall (just saying). 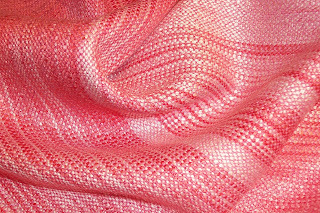 Painted warp scarves are $125. 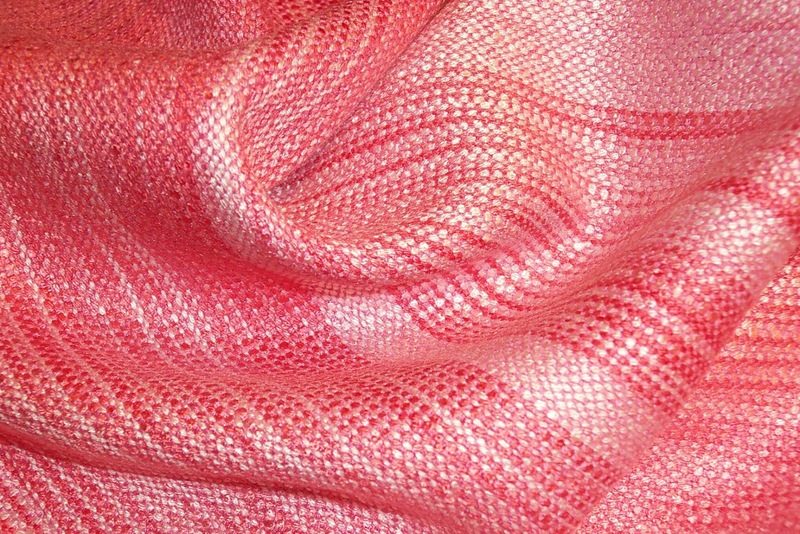 The silk shawl/scarves I wove during recovery are $150. A good crafts person learns as much as possible about their tools and materials as they can. 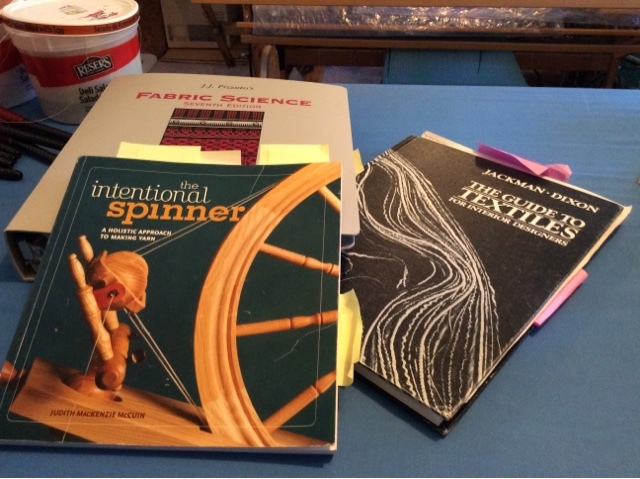 For weavers this means understanding the inherent characteristics of the fibres they work with and how preparation for, and then spinning them, will affect those characteristics. We got home yesterday. The trip had been very tiring, what with one thing and another and we were delighted and even relieved to be home again. We did the absolute minimum, rested, vegged, generally gathered ourselves together after such a hectic week and a bit. There was much to reflect on and things to consider. There is still almost zero energy, but considering I am just barely five months out from major surgery, AND that we wound up with food poisoning at some point (the joys of travel and eating every meal out) I think I am well on the road to recovery. 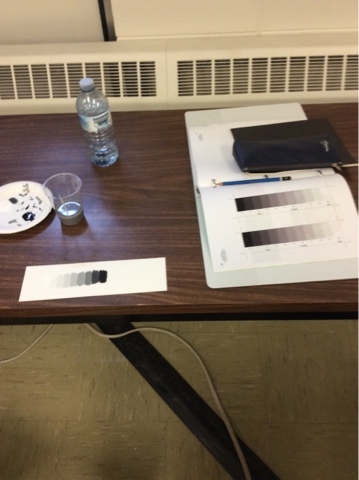 The experience of team teaching was good, especially as I wasn't feeling my best. My co-teacher is young and enthusiastic and I hope we can repeat the experience at some point. I think the students enjoyed it, too. Now that Olds is done, I have just a couple of weeks until company comes. I'm hoping to tame Clutter Mountain so I won't be embarrassed when she arrives. I need to weave like the wind to get things ready for the fall sales, so hopefully my energy will begin to return tomorrow. I am...and I never expected to say this again...thinking about another 'book', this time digital only, no hard copies, no samples. With less travel in my future I expect to have some time to devote to doing more of what I enjoy and less of what causes me stress. After a 40 year career, I have earned that benefit. Although I could not fit hemming into the van I am making good progress and expect to have these towels ready for my annual 'birthday' sale which will run from July 1 to the 9th. It will be another buy two items, get free shipping. Hopefully the computer will be back to functioning onTuesday so I can post photos of available items. Stay tuned! Hinton, AB, last night around 9 pm looking west at the Rockies. The mountains looked very atmospheric and it rained all the way through so we didn't get a very good view. But no matter the season or the weather the mountains are always inspiring. With interest in learning how to weave apparently growing, Olds College has agreed to establish a satellite program to begin next year in Prince George, BC. We are looking at holding it over the long May weekend. It would run Sat through Wed. With Monday a holiday, people who work would only have to book off two days for class time, not a full week. Details are currently being sorted out as college staff are still dealing with this years Fibre Week so I will post here and on social media as exact information becomes available. 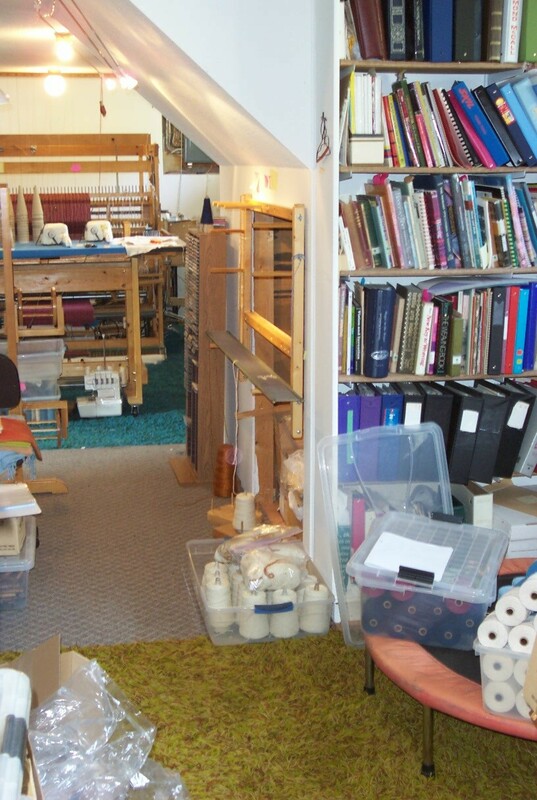 The Prince George guild has a small but fairly well equipped guild room and has some looms available for rent. The guild room is near several motels and restaurants for people coming from out of town. The town has an airport and is at the intersection of hwy 97 and 16 for those driving. So, we made it. It even stopped raining long enough to pack in. Set up went smoothly as we were able to drive the van right into the building, so even if it had been raining we would have been ok. And my classroom is in the same building. Zachary, bless his heart, took the cart with ALL the stuff for class to the classroom. 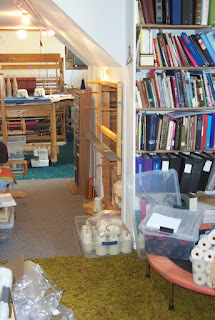 I'm hoping to get in early tomorrow morning so I can start unpacking ALL the boxes, get things set out on display and dress the loom with the value scale warp. All in all, things are going smoothly. I'm hoping for a nice quiet dinner and evening tonight. Here is how the booth looked. Well, part of it. We have two spaces, so you can't see all of it in this picture. After two consecutive warps with threading errors, I decided I needed some instant gratification and a palate cleanser and after many re-thinks eventually settled on a straight draw over 16 shafts. The tea towels will have a small repeating design rather than a larger one. 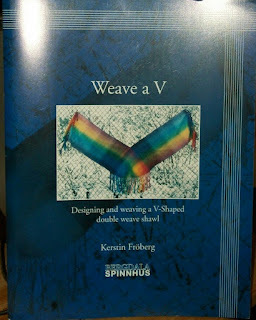 I also wound stripes of colours in the warp and wanted those stripes to take a larger role in the design. A little bit of something for everyone. I was reminded how much faster threading a straight draw is as I zoomed through the 768 ends in no time. 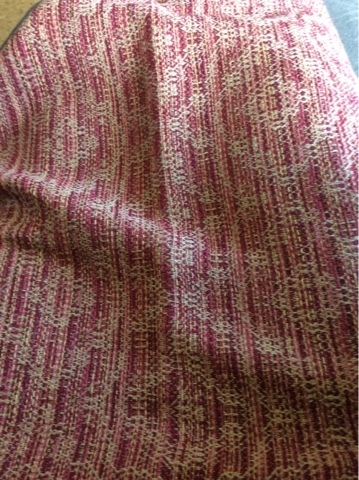 This morning I sleyed, tied on, generated the treading draft and wove just over one towel, all before lunch. Happiness! The colours, although subtle and may not show well in the photo, taken with my iPad, are pleasing to me. I have several other treading variations to try when I tire of this one. But in the meantime I'm enjoying the simplicity of this warp. And I'm using up stash! Feeling the pressure I wasted no time getting the next warp onto the AVL. It didn't hurt that Doug had to go out for a couple of hours last night which gave me just enough time to beam the warp. This warp went through about 10 iterations before it settled into its final form. In the end I threw out the original idea altogether. It happens! Which means I still have to come up with a workable idea for that cone of green linen, now back in the stash! 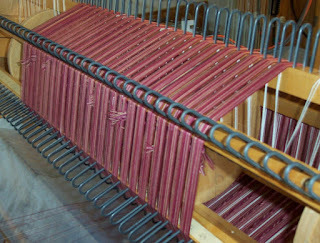 Once I can see the knots and the guide strings through the warp I know I'm nearly done. 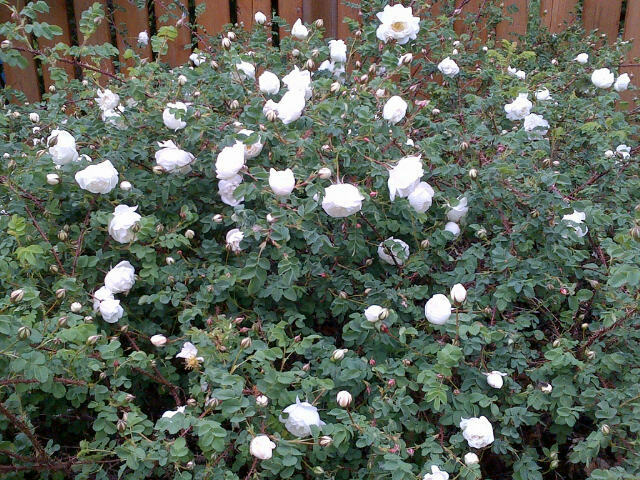 And not before time, either, as I'm getting a wee bit tired of this rose warp. On the other hand, the biggest investment made in a hand woven fabric is setting up the loom so it only makes sense to get as much out of that investment as possible. 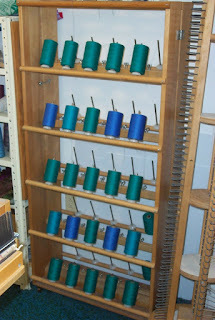 Which is why, as a production weaver, I tend to do 20, 30, 40 yard long warps. For my investment of three days of set up time, I get a week or two of weaving. 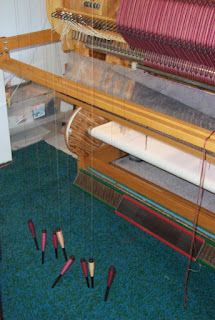 Quite often I will change weft, tie up and/or treadling during a 40 yard long warp. 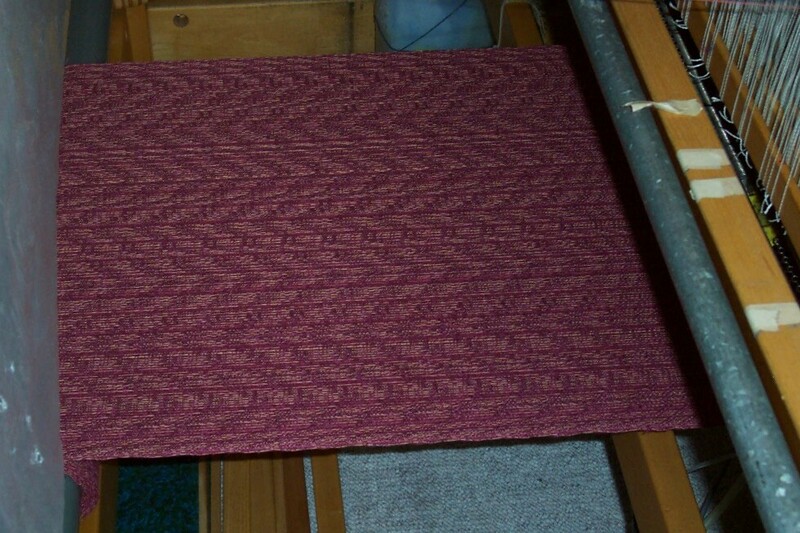 On this one I changed weft and treadling once and just wove off nearly 25 yards all the same. I was pretty happy with the floral nature of the design given the colours. Don't know if customers will find it appealing - time will tell. Speaking of time, I have rather mindlessly been weaving without too much regard for the up coming fall shows. Yes, the thought of doing four sales in Oct/Nov never really leaves my conscious awareness, but I haven't really been weaving with A Plan in place. Just trying to get my fitness back and use up stash. Once I'm home from Olds, however, the deadlines are going to start going critical. I am going to have to sit down at some point, maybe during the 11 hour trip there or back, and start making some goals for myself. I'm good for scarves, low on everything else. I do have yarn for another shawl warp which is in the queue, but I also need tea towels in a better selection of colours, and place mats? I pretty much sold out last year so I have to make at least that many this year, preferably more. 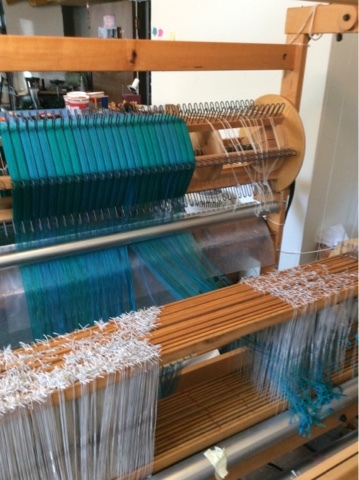 The coming months are going to be pretty busy with a focused drive to make sure I get to the loom every day and pound out the yards of cloth needed. And just think of all the stash I will use up! 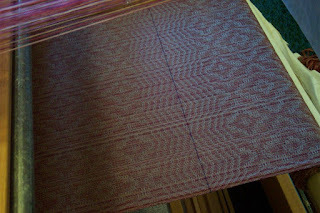 Getting close to the end of the rose warp so began thinking about the next. With the goal of using up stash and not buying more yarn, the creative limitation is to work with what I have. Even though I have lots of inventory of green/turquoise, here I go again. This time more of a sea green colour way. Since I also have a shawl warp planned in much the same colours, I seem to be working to a theme. Tomorrow I will work on refining my design idea just in case the desktop gets 'stuck' in the shop and I don't get it back again on Monday. I'm hoping to finish the rose by Monday at the latest and beam this warp before I leave for Olds. Whether or not I'll get it threaded, only time will tell. But, since this is one of my favourite colours to work with, it's a bit of a 'carrot' to help me get through the next couple of weeks. 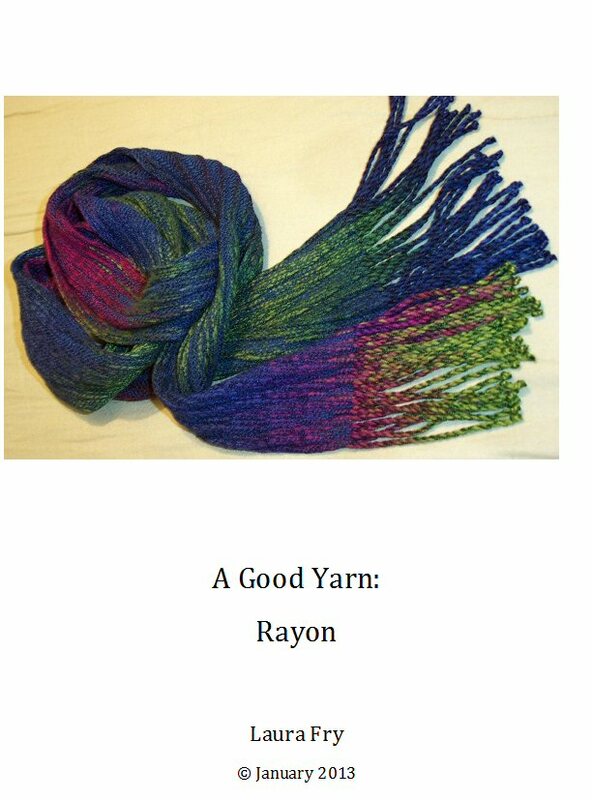 I have to decide if I'm going to go with another 40 yard long warp or do a shorter one. 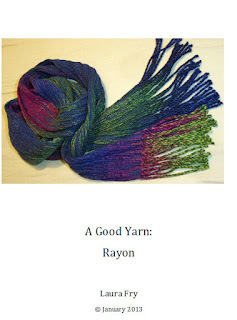 There are still shawls that need weaving, too. One of my favourite reference books. You can tell because of all the post it notes sticking out! 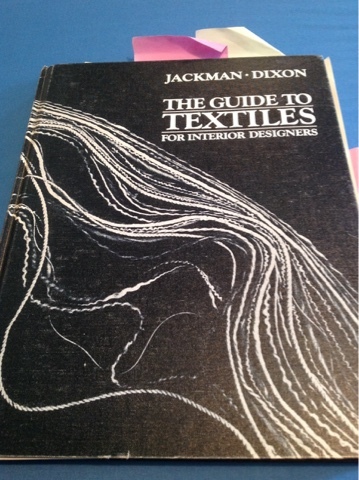 A Guide to Textiles for Interior Designers began life as a textbook in the early 1980's, which is when I bought it for the princely sum of $35US...at a time when paperbacks were selling for under a dollar. Since then I have used it frequently. It is my go to resource for anything related to fibre or fabric characteristics. I love the format, the graphics and charts. Dense information given in a straight forward clear manner. You don't need the recently published second edition. This first edition is readily available on second hand book sites for a fraction of the cost. And with every penny. 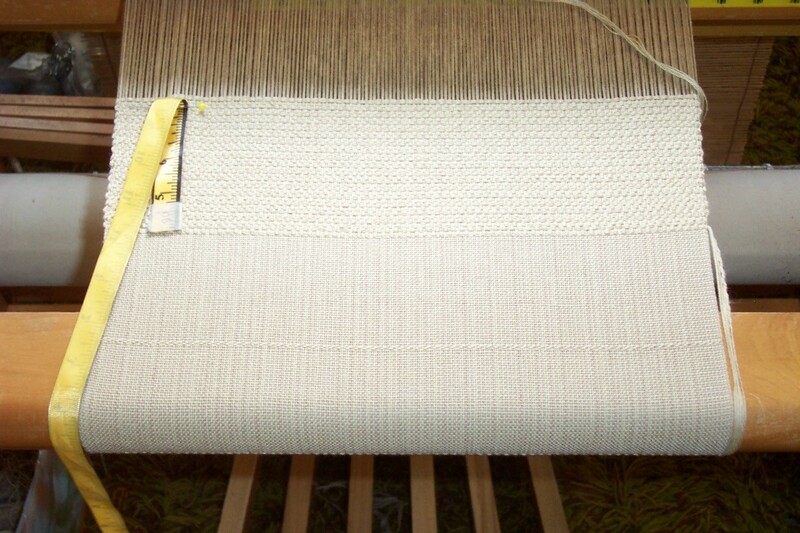 Here is a peek at the warp with the natural linen weft. It clearly shows how I deal with hems...in this case it is a straight progression for 3 inches, then start with the body of the towel. At the other end, the progression begins from the other end in order to flow with the pattern. Where one towel ends and the other begins, I have woven in a contrasting colour to serve as a cut line. Some people like to hem before they wet finish. I prefer to hem after the cloth has been wet finished and given a good hard press. That way the cloth is as flat (thin) as possible. Once hemmed, they get a finishing press to flatten the hem and take out any fold/crease marks from the hemming. In terms of my approach to designing? If one colour is good, 5 or 6 has to be better! The warp is several shades of a pink through burgundy plus several shades of a warm reddish beige, almost peach, all mixed up together. 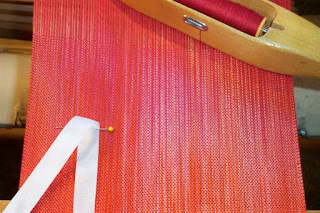 The dark pink weft emphasized the reds, the natural linen is a much lighter value and is making the cloth look a lot more pastel. I quite like it. I hope the customers do, too. Look familiar? It should. It's the state of the studio - still. I'm beginning to feel like a character in Ground Hog Day - you know, the same day that dawns over and over again? I've said it before and I'm going to say it again. I am not going to miss doing yarn sales. The amount of time and effort required? The hefting of heavy boxes, standing (usually) on concrete, long hours, long drives...I'm so done. I will have copies of A Good Yarn: Rayon and Weave a V (latter by Kerstin Froberg) for sale at Olds. I'm also not doing publications any more - at least, not 'real' ones. It remains to be seen if I will actually get to doing digital ones. Sunday - a day of rest. Heh. Doug is off pressing a bazillion place mats and tea towels and I've been carrying on with the warp winding. The 24 individual student warps are now done - they are in baggies in the bin on the floor. I've just begun the first of the value gamps. Rather than have each person do one, we are making a warp per classroom. With 12 in each class (24 in total) it's much easier if each classroom has it's own loom and value gamp for the students to rotate through as time and energy allows. The classrooms are open in the evening so students can catch up on their class work in the evening if they want. The skies are looking threatening again and if I'm going to get a walk in today, I better go now. The forecast is for rain later in the day. And I'm trying really hard to walk every day, even if I don't always make it. With a follow up stress test booked for the fall, I want to be as fit as possible for it. Not to mention I'd like my 'old' level of 'fitness' back for my own self. Before needing the surgery I could easily walk up four flights of stairs without thinking about it. Right now I'm at about 2.5 flights and my thighs start to 'burn'. I suppose what 'they' say is correct...the older you get, the harder it is to get your fitness back when you've 'lost' it. Today was open house at the guild so not much happening in the studio. I did, however, get the rest of the tea towels hemmed, just in time for Doug to press them tomorrow if he has time after doing the 3 dozen mats and 3 table runners. For the past few days he has been converting skeins into cones, helping me get the yarn ready for the Olds Level One students. There are 24 students in all and I offered to wind the warps for their first sample and the two value gamp warps. We are also getting yarn ready for the vendor booth - the bins on the far right need their labels yet. I'm not quite (quite!) overwhelmed yet but the days are counting down until we leave and there is a lot to be done. And oh yes, maybe even some weaving. 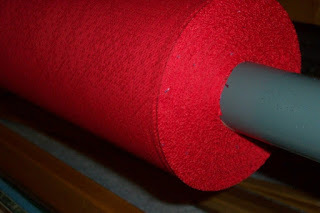 Several people have asked about hem treatments recently so I thought it might be good to discuss them again. Do a search for 'hems' for more posts. 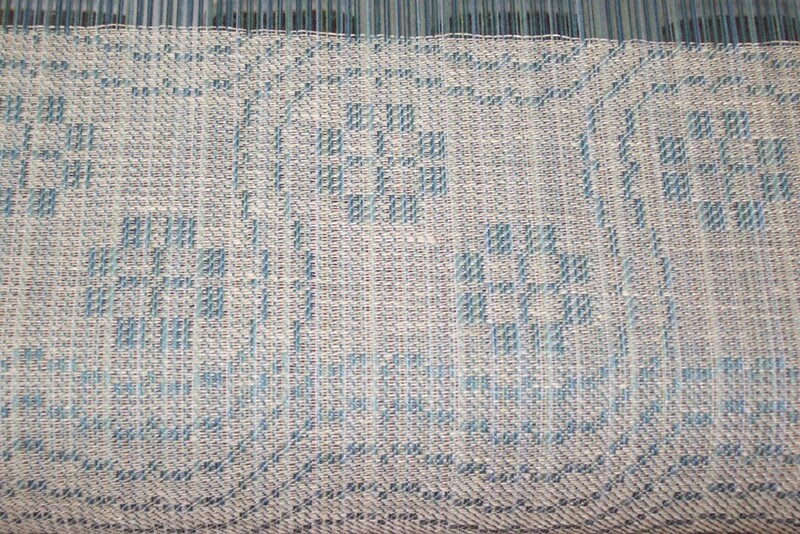 Above is the place mat warp I was weaving today. 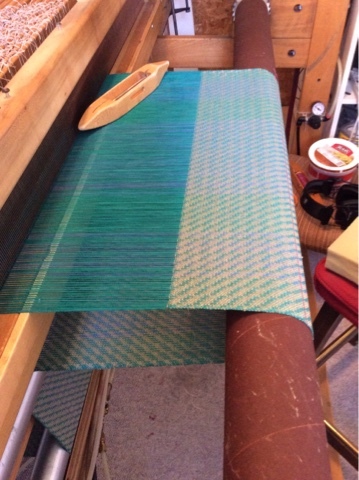 * Click on the photo to biggify so you can see the area of plain weave, the two picks of twill which create a cut line and the heavier body of the mat. 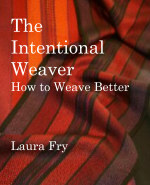 I weave a plain weave hem when the body of the textile is going to be too thick to turn a decent hem. Since I'm not a big fan of fringes, especially on place mats and tea towels, my preference is always to hem those. These towels were based on the Spring Bouquet towels I did for Handwoven a year ago. They are woven from 2/8 cotton at 20 epi with a cotton slub in twill for weft. The body is, in my opinion, too thick to make a nice hem so the hems were woven in plain weave with 2/16 cotton for weft. 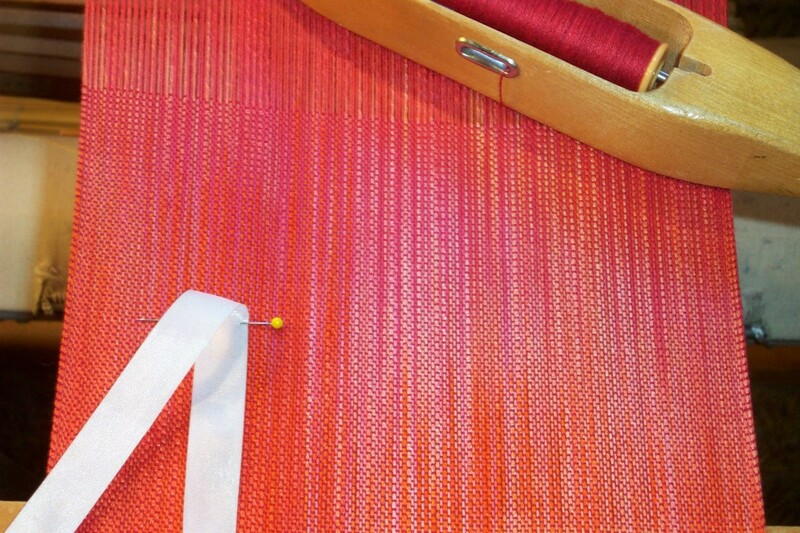 When turning the hems on a striped cloth, try to line up the stripes. And yes, I hand hem - it works for me. 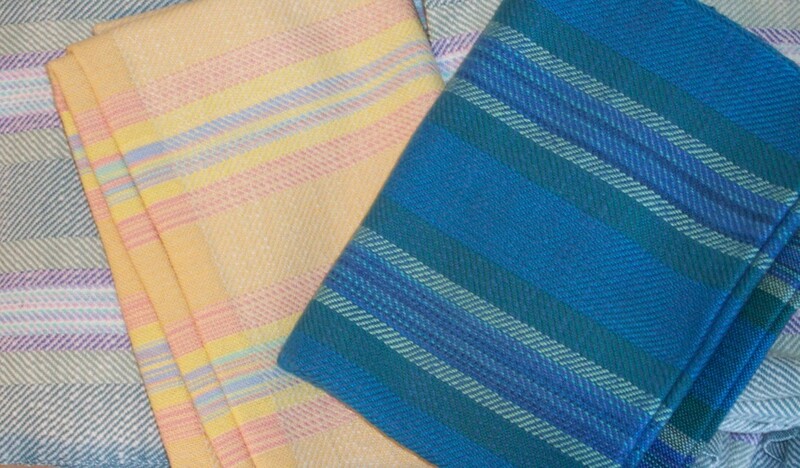 These towels are woven from 2/16 cotton at 32 epi and a fine singles linen (probably 20's) for weft. The body of the cloth is much thinner than the above towels and easily turns a hem. You can see the border at the start where I've not woven the pattern for the hem part but simply repeated a single repeat of each block in a straight progression. The pattern doesn't run off the end, so to speak, and the towels has a 'border' of the small block repeat on each side and the ends. That's not to say I don't sometimes let the pattern run off the end. *I just run the bundled weft up the side of the mat and when hemming that gets tucked into the hem. And no, there is no floating selvedge. I don't use them. With the news that I will be having a follow up stress test in the autumn I renewed my pledge (to myself) to walk daily - I want to be as fit as possible when it comes time to hit the treadmill. 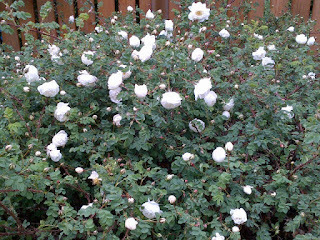 Part of my path goes by a row of rose bushes. I've been watching the buds get bigger and bigger and today some of them had burst forth in an exuberant display. With a forecast of much warmer weather for the coming week, they might not last long, though, so I will enjoy them for as long as they do. Today the yarn order arrived. You remember, the yarn order I had to put in because we sold so much yarn at Red Deer we didn't have enough for the vendor booth at Olds? Yes, that order. Two large bunny eared bags of goodness, plus a small box. As Doug minds the cone winder and I try to find the files for the labels, I'm reminded again of why I'm getting out of the yarn selling business. I'd really rather be weaving than rooting through my computer (which appears to be dying!) looking for files or generating new ones when I can't find the old ones. 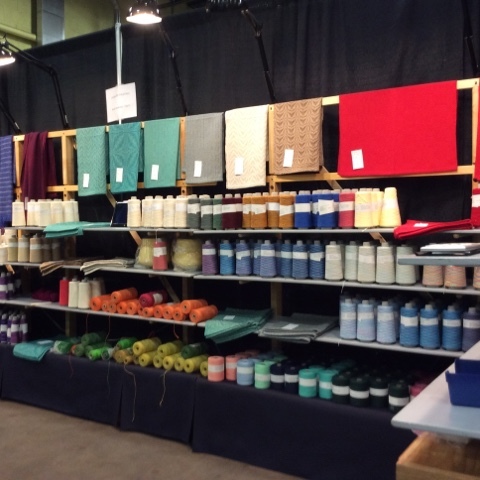 Even though I will miss visiting with the participants at the shows, I'm not going to miss lugging heavy boxes of yarn, dealing with the paperwork, etc., etc. It's time to let that go and carry on with what makes my little heart go pit-a-pat. And that is weaving. Even with 8 pirns dangling off the back of the loom! I discovered that if I am very, very careful about letting the pirns down exactly as far as they can go, I can in fact get two towels woven before I have to drop them again. 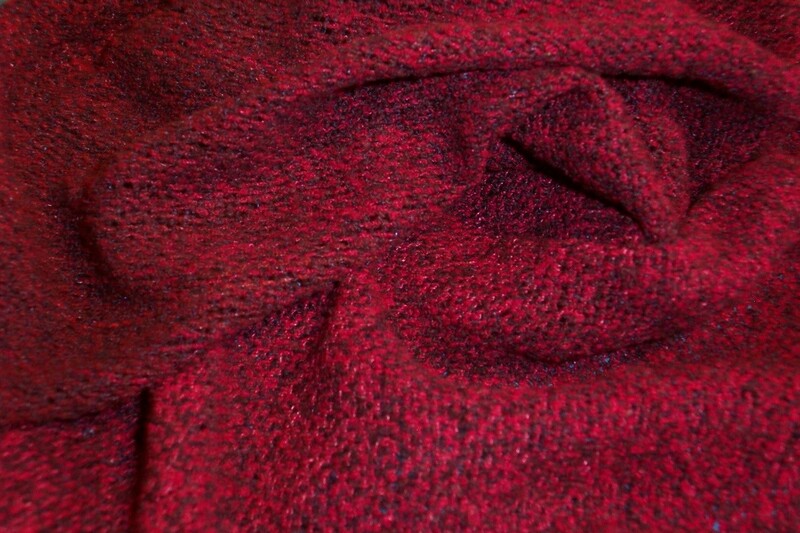 Just finished winding the rest of the rose off onto bobbins so when that is done, that is another cone used up. My next choice for weft is a three strand (it's not plied) linen which is pretty much the same grist as the warp and should weave up nicely. I'm hoping the humidors will help keep the yarn co-operative. There is a meme on Facebook that says that a master has failed more than the student has tried. Photographic proof that I am batting 1000 in terms of making mistakes setting up the AVL! Since I beam sectionally (most times) on the AVL, I rarely have precisely the number of ends that I need. 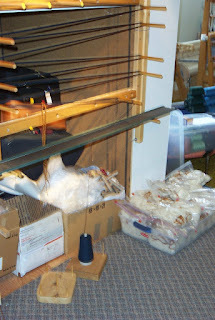 Quite often there are a few dangling off the back of the loom. When I finished threading yesterday morning, however, there were rather more than I usually have so I was suspicious I'd made another threading error. This time it was more annoying than just forgetting one end. This time I'd left out eight! Heaving a sigh, I started tying repair heddles on the shafts where they were needed, wound 8 pirns about half full and threaded them into the repair heddles. Then under the sectional beam tension box rail and up over the rod in the ceiling (installed for just this purpose many moons ago) and left to hang down near the floor.